After pulling freshly baked lemon bars from the oven, she switches tasks, first chopping onions and serrano chilies and then adding them to a traditional Mexican molcajete (mortar) in which she’s ground herbs and mashed avocados for her favorite guacamole. After tasting the result, her face lights up with a smile of approval. The Encinitas resident, a sixth-grader at The Rhoades School, is a seasoned cook with a repertoire of well over 100 recipes that she developed and refined herself. Warm, funny and mature beyond her years, Gracie has a full roster of activities typical for kids her age, along with multiple stage credits. She’s also the poised veteran of two seasons on the Fox network’s “MasterChef Junior,” recorded when she was only 8 and 9. That experience, explains mom and self-described sous-chef Melissa Howard, helped deepen Gracie’s culinary knowledge while honing her cooking and presentation skills. It also taught both mother and daughter many life lessons about resilience and survival in a highly competitive world. Gracie began cooking with her parents, Melissa and Mark, at age 3 or 4, though she got her first taste of cooking at 2 with the gift of a play kitchen. The “play” aspect didn’t satisfy for long her hunger for hands-on experience. Dad Mark, a business owner, is an avid gardener, growing most of the family’s fruit, vegetables and herbs in their gardens, with help from budding gardener Gracie. He taught his eager young daughter how to tell when fruits and vegetables are ripe and ready for harvesting. Some of her earliest creations, Melissa explains, were fruit salads crafted from their garden’s bounty. Fish and seafood dominate their home meals, thanks to Mark’s passion for fishing, which he’s passed along to his daughter. She caught her first large fish, about as long as she was tall, at age 5. He regularly fills the family’s freezers with salmon from Alaska and tuna, halibut, seabass and other local varieties caught from the family’s Shelter Island-docked boat. Melissa and Gracie often accompany him on fishing trips, with Gracie preparing her own version of ahi poke and other favorite fish dishes on board. She shared her poke recipe in her quarterly cooking column, Gracie’s Culinary Corner, in the online Child Photo Magazine. For the Howards, cooking is a family affair. 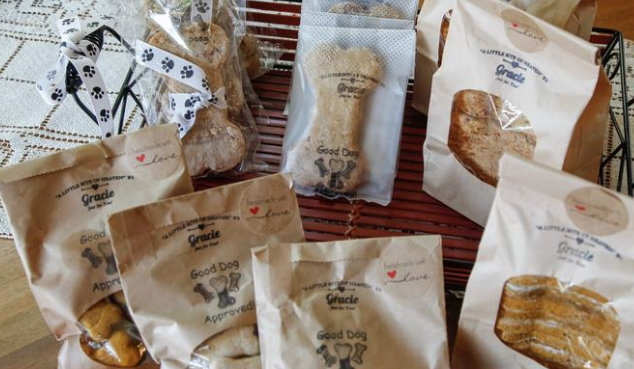 Their expansive kitchen is filled with laughter, music, singing and dancing, as their three rescue dogs happily scarf up anything that falls from the counters. Gracie demonstrated the breadth of her culinary knowledge as she discussed some of her experiences on the cooking show, including the need to learn more about cooking meat. One of the important lessons is that “it’s OK to make mistakes, but it’s better to know how to fix them,” she says as she pulls pin-bones from a side of salmon before scoring it. She then arranged a “boat” of aluminum foil on an ovenproof tray to hold the salmon and retain its mustard and honey glaze during baking. “Every dish needs to have all the elements; even cupcakes need to be sweet, tangy and crunchy, to have zip,” she says. She’ll often tinker with recipes, changing or adding an ingredient, such as lemon zest, to bring them to life. Gracie’s artistic bent shows up in her approach to presenting food on the plate. To accompany the salmon, she chose white sweet potatoes for their color rather than the orange or purple she normally prefers because of their greater nutrients. To add color and complementary flavors she prepared a summer salad with Persian cucumbers, tomatoes, ruby red grapefruit and kumquats, all harvested from their garden. Baking is one of Gracie’s favorite pursuits. Cooking shows, including her favorite “Cupcake Wars,” spurred her interest in baking, Melissa explains. Her stint on “MasterChef Junior” inspired Gracie to start a bake sale stand to combine her culinary skills with her charitable instincts. Her parents have nurtured her to understand the importance of helping others and giving back to the community. 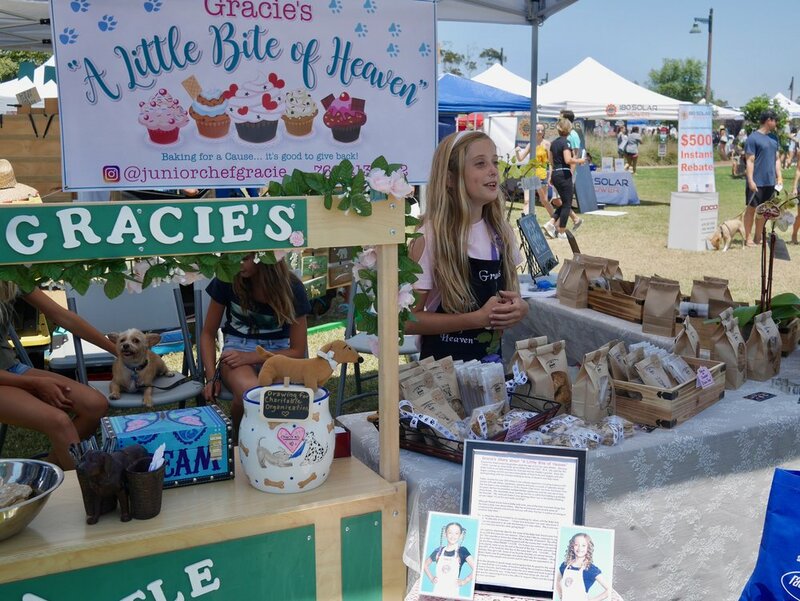 Gracie’s “Little Bite of Heaven” stand became the perfect vehicle for her charitable efforts, enabling her to raise money at special events for favorite charities, including the Angels Foster Family Network and animal rescue organizations, for which she developed recipes for homemade dog biscuits. While Gracie loves to spend time in the kitchen devising new recipes, she’s also “a normal kid,” says Melissa, who ensures her daughter has time outside school to romp with her dogs and hang out with other kids, along with pursuing her interests in art, theater and volleyball. “She’s a little girl with a lot of passion and pizazz for life, a joyful jewel,” her proud mother says. Whatever tack she takes, Gracie is sure to enrich the world around her.